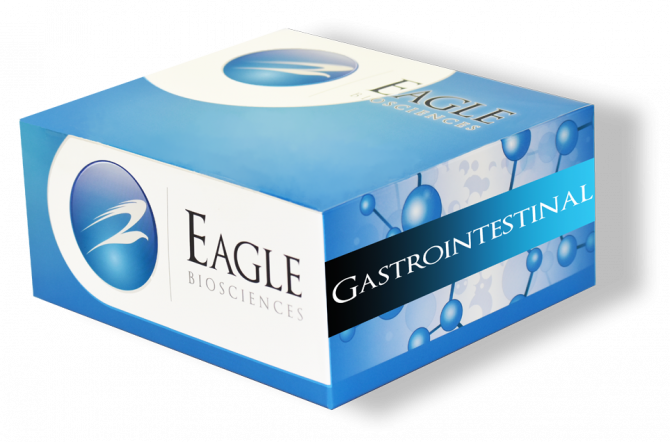 The Eagle Biosciences Zonulin Serum ELISA Assay Kit is intended for the quantitative determination of zonulin in serum. The Zonulin Serum ELISA Assay Kit is for research use only. Zonulin is a novel human protein analogue to the zonula occludens toxin derived from Vibrio cholerae which participates in tight junctions between cells of the wall of the digestive tract. Zonulin binds to a specific receptor on the surface of intestinal epithelia and triggers a cascade of biochemical events which induces tight junction disassembly and a subsequent permeability increase of the intestinal epithelia, allowing some substances to pass through and activate immune reactions. Dr. Fasano and his co-workers found out that the zonulin-zonulin-receptor-system is more activated in celiac disease and type 1 diabetes mellitus patients. Patients with active celiac disease showed higher levels of zonulin and anti-zonulin antibodies compared to non-celiac patients and patients in remission, who were on a glutenfree diet. Concerning the autoimmune type 1 diabetes, in experiments with rats it could be demonstrated that elevated zonulin levels as well as increased intestinal permeability precede a type 1 diabetes disease. Conversely, type 1 diabetes could be prevented by inhibition of zonulin in animal experiments. In addition, it was reported that many people who suffer from celiac disease also suffer from other autoimmune disorders. It is suggested that increased levels of zonulin are a contributing factor to the development of celiac disease and other autoimmune disorders such as insulin dependent diabetes, multiple sclerosis and rheumatoid arthritis. This Zonulin Serum ELISA Assay Kit is based on the method of competitive ELISA. As a first preparation step,a biotinylated zonulin tracer is added to the samples, standards and controls. Afterwards, aliquots of the treated samples, standards and controls are transferred and incubated in microtiter plate wells coated with polyclonal anti-zonulin antibodies. During the incubation, the free target antigen in the samples competes with the biotinylated zonulin tracer for the binding of the polyclonal anti-zonulin antibodies immobilised on the microtiter plate wells. The unbound components are removed by a washing step. During a second incubation step, peroxidase-labelled streptavidin, which binds to the biotinylated zonulin tracer, is added into each microtiter well. After a washing step to remove the unbound components, the peroxidase substrate tetramethylbenzidine (TMB) is added. Finally, the enzymatic reaction is terminated by an acidic stop solution. The colour changes from blue to yellow and the absorbance is measured in the photometer at 450 nm. The intensity of the yellow colour is inverse proportional to the zonulin concentration in the sample; this means, high zonulin concentration in the sample reduces the concentration of the biotinylated zonulin tracer bound to the immobilised anti-zonulin antibodies and lowers the photometric signal. A dose response curve of absorbance unit (optical density, OD at 450 nm) vs. concentration is generated, using the values obtained from the standard. Zonulin, present in the patient samples, is determined directly from this curve.